This entry was posted on Saturday, February 26th, 2011 at 8:07 am and is filed under pubs and York. Tagged: Black Swan, Copper Dragon, Morris Dancing, Old Peculiar, pubs, theakston, Wickerman, york. You can feed this entry. You can leave a response, or trackback from your own site. Your writing is SO GODDAMN GOOD these days. I’m sorry the Old Peculiar wasn’t up to scratch! Just catching up with your Northern adventures – is it permanent? York is such an amazing place to visit and drink – am very envious! Hi Boak, thanks for checking in! It is permanent. Mike (I think you met him at the White Horse once?) got a job up here and we have relocated. I am loving life up here– fascinating, friendly & there is amazing beer. I miss London though. Next time I am down we’ll have to see if we can get in some knitting & beering. I can’t name that side (they prefer that to ‘troupe’, although ‘team’ is acceptable), but the style of dance is rapper, originally from the Northumberland and Durham area. Rapper is the name of the swords they use. I’m not a dancer myself, but I’m friends with the Southport Swords, who organised the DERT tournament (Dance England Rapper Tournament) in Liverpool a couple of years ago (motto: You’ll Never dance Alone), at which I helped. I was surprised how many young dancers there were, including all-female sides, one of which came from Aberdeen, even though rapper is not a Scottish dance form. Apparently they go out at weekends dancing around Aberdeen pubs and get all their drinks bought for them. Neville, thanks for enlightening me. I have to say the Rapper was the favourite dance I saw that day in Hastings. Would love to go the the festival in Liverpool if it happens again, or, really any Morris events up North. 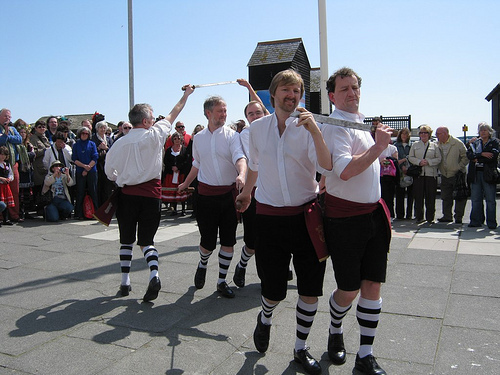 Southport Swords (not knives) are hosting a one day morris dance event in the city of Liverpool on 19th May 2012. There will be sword dancing, rapper dancing, north west morris and cotswold morris on display. Loads of real ale pubs in the city and Liverpudlians are soooooo friendly. Email Southport.swords@gmail.com for details if you are interested in this. http://theculturevulture.co.uk/blog/people-and-places/the-haunted-pubs-of-leeds/ – Hey Ally! 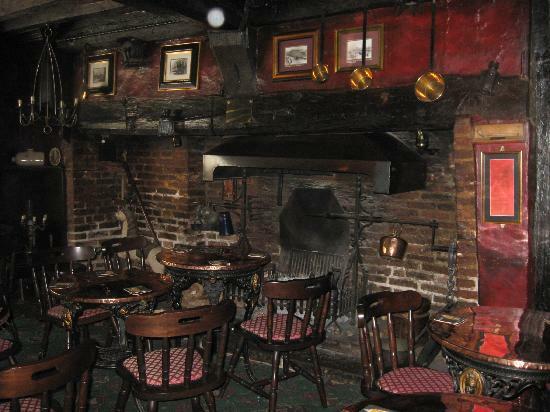 Here’s that other article we spoke about re: haunted pubs in Leeds. Just some associated reading! See you soon! Thanks, Leigh! I look forward to reading this. See you soon! Black Swan Rapper are based in York. They are young, highly energetic side that I’ve seen on several occasions, and they always get the crowd going when they dance. You can see them in a very unusual setting here. It really is magic! Paul O’Grady is quite the sport to try it. I believe the set of swords in the Black Swan were won at DERT by Black Swan Rapper (named after the pub). What sort of a difference to the taste of a brew do things like temperature, bubliness (this sort of thing – http://www.wesureservegoodbeer.com/pouring_the_perfect_pint.cfm) make?